Knowing how to shuffle cards is one of those things which everybody really should know how to do. Today I will not teach you people how to regularly shuffle, but instead I will teach you the most efficient and coolest way to shuffle cards, the riffle shuffle. It is also, in my opinion, by far the most fun way to shuffle cards. I am sure that you will agree with me that the riffle shuffle is the best type of shuffle (if you do not already) after reading this article. First of all, let me give credit to my dad for teaching this to me. Thanks! After my dad told me how to riffle shuffle cards, after about five minutes I was a master at it. I am sure that you too will me able to be an expert at riffle shuffling after you finish reading this text and watch the video below. Knowing how to shuffle in this way is really important whether you just want to play cards with someone, or if you want to show them some card tricks that are amazing. Learning how to stylishly mix up a deck of playing cards is actually extremely easy. Here is how you do it. You want to divide the deck into approximately half; close to 26 cards in each pile. Then, to have a successful riffle shuffle, you must get a comfortable grip on the two halves. 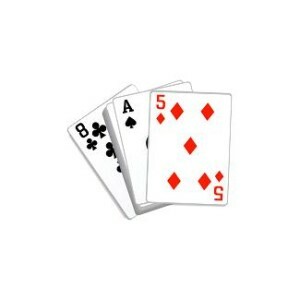 The best and most common way to do so is to on one side of the pile grip the cards with your second and third finger. On the other side of the half, grip it with your thumb. Your grip on the cards should be the same with both the halves. Now with the side of the halves that you are holding with your thumb, let down as close to one card as best as you can at one time from one half. Then let about 1-3 cards from the other pile down, and keep alternating until the whole deck is finished. The better you alternate, the easier it will be to perform the ending cascading effect, which I will introduce you to in the next paragraph. But to be able to perform the deck, you cannot have chunks that you had let down from riffling. So what you have to do to get the effect is take your two thumbs, and place them in the center of where the two halves are overlapping. Make sure that your thumbs are not pressing weakly, and have quite a lot of pressure on the deck. If they are not pressing the deck with some force, then when you try the next few steps, the cards may just fly all over the place. Remember that this thumb step is quite important. Then take all of your other fingers from both hands and place them on this two sides of the deck. Slowly and gently lift the deck a little bit of the table or ground, and as soon as you pick the deck up, bend the cards toward the ground. This will make the cards into something that looks like a tunnel. The better you make it look like a tunnel, the easier it will be to do the next step, which is gently releasing the pressure from your palms and fingers, giving the cards a lovely sound as they drop into your hand. This is the cascading effect and ending of this shuffle, which separates this particular type of shuffling from other shuffles. I understand if you are pretty confused of how exactly to perform this spectacular shuffle. This is because in words it is pretty hard to explain how to do this kind of shuffle. But, watch this short video below that I have put together to help you understand how to riffle shuffle. And right after viewing this video, I am sure that in no time you will be a pro at knowing how to shuffle cards. I hope that you like my video and that you learn something from it. Thanks!